Circular lead fabric weight. There is a circular recess on one side, within which are two circular holes that pierce the disc. 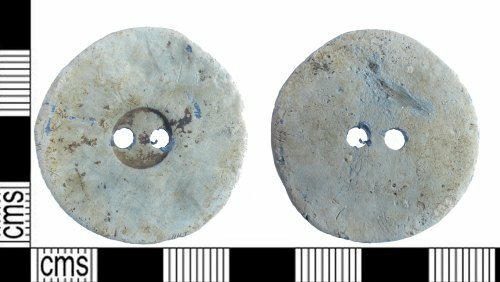 Despite looking like a button, these weights were and are used to weigh down the hems of curtains, and perhaps also skirts. Examples can be seen on page 83 of Bailey's (2004) Buttons and Fasteners. They seem to come into use perhaps in the eighteenth century, and are still available to buy today.